Dutch schools, especially primary schools (age 5-12) make a lot of trips. They do so to access sport facilities, to visit museums, city centres or the countryside. Actually, they go more or less anywhere by bike unless distances are very long in which case a coach will be hired. 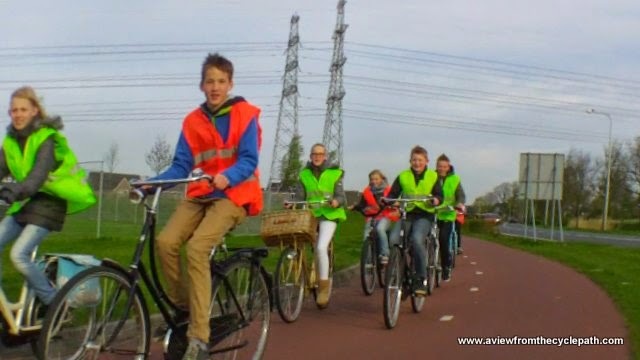 As a result, school bike trips are a very common sight in the Netherlands. This video was made on the last day of the April study tour. Two different school groups passed us within a matter of minutes. We saw the first at a simultaneous green crossing - demonstrating precisely the sort of infrastructure which successfully keeps all cyclists safe in the Netherlands. The others were seen as they rode along a cycle-path a few short distance from that same crossing. It is high quality infrastructure like this which enables true mass cycling to take place. What is good for the kids is also good for adults, and this is why cycling encompasses all demographic groups in the Netherlands. It's quite common for teachers to wear bright clothing to make them identifiable. In this case there were two teachers or parents at the front of the group and one at the rear. Note how in this photo and in the video above, children are encouraged to ride side-by-side. This group had clearly not come from very far away as some had decided to walk. A few of them "hitchhiked" on the back of other childrens' bikes. A young group of children, with teachers in orange, at the museum in the centre of the city. This photo from a few days back shows an increasing tendency for children to be given reflective vests. If the vests are intended simply to make children identifiable when in a busy area, that's one thing. However, if there's scaremongering involved then this is something we need to be very wary of. Children are in no significant danger when cycling on excellent infrastructure like this cycle-path. We often see school trips during the study tours. I caught another on video last year. Somehow I suspect the reflective vests are only a way of marking them as part of a group. At least that would be the hope. Another enjoyable post as usual David. Thanks. Usually kids of this age cycle to school every day, I suspect they're in the last grade of elementary school. They will be used to cycling all over town. So the vests are for supervision purposes, to make it easier to keep an eye on the kids and prevent any one of them wandering off alone, or easier to pick up any stragglers. It should also be noted that Dutch children are provided by their parents with properly fitting, practical bicycles. As these pictures and video clearly show, these bikes all have lights, chainguards, luggage racks and mudguards fitted as standard. Some of them have gears, others don’t, but all of them have a comfortable upright position which allows the children a good view of the traffic around them and enables them to propel themselves in a safe and stable manner. This comes as no surprise of course as bikes for children are seen as serious modes of transport rather than as toys, like here in the UK. I wonder if any of the teachers in the video would be happy to guide a bunch of British children through traffic, on their ill-fitting, overgeared, forward leaning, wobbly (but brightly couloured) bicycles. Not that Dutch children are denied to have fun with bikes. I suspect quite a few of them will have another bike at home, perhaps an ATB to fool around on, or a drop handle racer to practise cycling as a sport. As all parents in the Netherlands cycle themselves, they know what to choose for their children. Safety will always come before fashion (although Dutch brands, under pressure from the mountainbike rage, are doing a good job at making their children’s bikes more attractive). In Britain, where few parents cycle and even fewer are familiar with practical bicycles, anything goes, as long as it is cheap and has enough street cred. Without the knowledge and the experience parents naturally buy what is readily available, but bicycle retailers do not offer much choice, and don’t do ‘practical’ anyway. For British children to be able to travel as free and independent on their bicycles as their Dutch counterparts they certainly need a safer environment, but they need better bicycles too.